It was December 21 last year. After building a house in Puerto Cayo, Ecuador for nine months (with 100% of the communications via internet) Dana and I got on a plane, beside ourselves with excitement to fly way South, and spend just more than three months in our new far-away, get-away. Truth is, we really didn’t even know if we’d come back. In my 47 years it’s among the most exciting adventures I’ve taken. Three days after our Memphis departure, we arrived, just as the workers were putting the finishing touches on our Casa Azul. That’s actually what everyone calls our house, and it’s even our “official” address, as much as addresses exist in Puerto Cayo. After nine long months, it seemed, in the blink of an eye, we were home owners in Latin America. Crazy stuff for a couple of country kids from Arkansas. 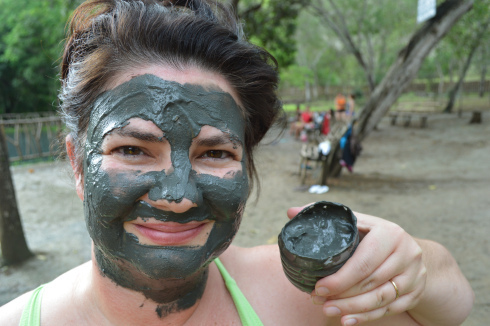 Dana, during a filming break at the Agua Blanca mud bath. This is a scene you’ll see on House Hunters. During the next few weeks, we learned about things like cisterns, suicide showers, scorpions, freshly caught langostinos , driving where driving rules don’t exist, and we “unlearned” everything we thought we ever knew, embracing life in a new culture. I hate the cliche’, but it’s true. Our lives have never been, and will never again, be the same. Puerto Cayo (key port), is a small and beautiful, but remote village on Ecuador’s central Pacific coast. The town has about 4,000 people with maybe 100 “foreign” expats. Its remote proximity and small size add to the irony that two couples who ultimately became our friends, had previously done their own shows with House Hunters International. When the filming company that produces the show contacted them about anyone else they knew who might be interested, they recommended us, and the lines of communication quickly opened. A few days later, we found ourselves Skyping several times zones away with a casting director in London, where it really all begins. The phone call was surreal. There had been days when things (about life in general) weren’t so hopeful. Just a few years earlier we’d invested all we had in our own business – dynamic publishing company – that was born just about the time the economy crashed. I closed its doors in less than a year, and spent a long time wondering what was next. It was during this uncertain time that we became HHI fans and spent many nights dreaming the craziest of dreams despite the circumstances. It was crazy, irrational and unrealistic that we would dream such dreams. But I’m oh, so glad we did. I’m glad we never gave up on dreaming. Me, getting a much needed and first haircut in Latin America. 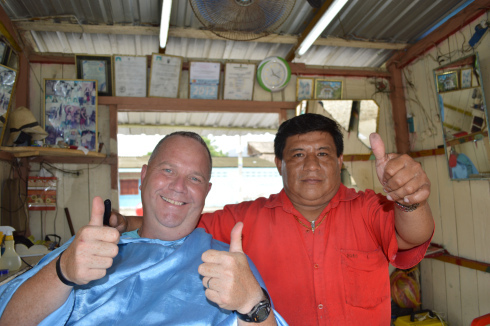 My barber, Antonio, shows the approval of his handiwork. and women – especially couples who love adventure and don’t mind stepping out of their comfort zones. And there are many things about buying a house in a far-away country that will NOT feel comfortable. For 45 minutes on the Skype call we shared our story about all the things that had drawn us to Ecuador … childhood dreams, a crazy sense of shared adventure, and a touch of rebellion, all carefully mixed together with a pinch of mid-life crisis … and I knew the conversation was going well. At the call’s conclusion, casting director Michelle James said she’d like to move the process to the next step, and asked us to produce our own three-minute casting video about us and our lives in Puerto Cayo. I told her it would be ready in seven days. I couldn’t believe we were really, seriously talking to the people who could actually make it happen, and that they wanted to continue a conversation with us. Fortunately, Dana had enough foresight early on to bring a tripod on our trip. Over the next three to four days we filmed in our house, on the beach, shopping in town and any number of places that would help convey life in Puerto Cayo. I was the creative director and logistics guy. Dana was executive producer. Three minutes quickly became seven, and we let the length stand, uploaded it to Vimeo and waited. We thought it would be three to four weeks before we heard a peep from them, if we heard back at all. Four days later, Michelle responded, said the producers loved it, and invited us to work with them. I’ll never forget telling Dana we were going to be on the show. In life’s grand scheme it’s pretty insignificant, but it felt wonderfully redemptive. And filming the show was … so … much … fun. Great to read this, Steve. Please let us know when your episode is on. How’ve you been lately? Hi, Holly. Doing well, thanks. I’ve been on a self-imposed writer’s sabbatical for a few months and and trying very hard to get myself geared up to write my first piece of fiction. I’ve never done it, and am scared to death. Will also be traveling back to Ecuador a couple of times before the end of the year. I saw your photos from your India trip, keep up with your wonderfully over-achieving kids on FB, and continue to pray for your own work. I recently noticed that you have a couple of pieces with your agent, and are working on a new novel. Your big day will come soon. I’m sure of that! thanks Steve. You can write fiction. I did it! As a nonfiction writer, though, I had to loosen up my writing and not worry about AP style. Haha. Thanks for the encouragement, too. Waiting is not fun! here we go! 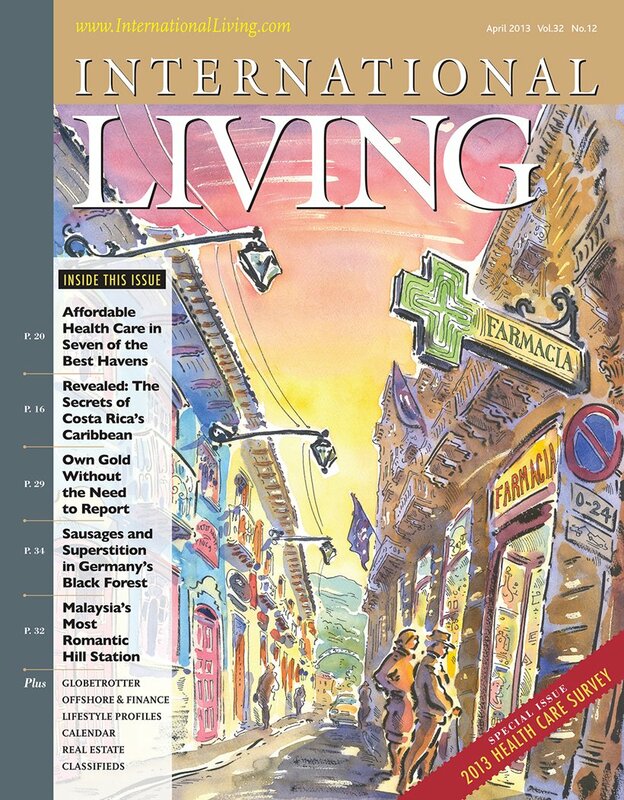 Read about our adventure of getting on and taping a House Hunters International episode in Ecuador and Arkansas!